Kaye Llewelyn is a Zürich-based artist whose recently released children’s picture book, Pocket Money, conveys a playfulness and a world of serendipitous possibility through images without words. Here, she talks about the process of hand-publishing the book in Zürich, and about her extensive professional experience, including the First-Step Method for children’s development. Welcome, Kaye, can you start by telling us a bit about how the idea for the book Pocket Money came to be? The book is literally a picture book, with no words—why did you decide to stick to just the paintings? I get tangled in words. I love them, but they play tricks with me. I’d been trying to write a children’s book for a while. This one though, started in pictures, and when I went looking for words for it, there weren’t really any. Then out of that, opened a whole new story of not having words, maybe not having a language, or just being shy. Now I think, without words it opens up conversation in all kinds of things like the value of awareness, of noticing, slowing down, caring, or simply the communication of ‘kind’. Tell us what it was like putting the book together yourself by hand. Not many authors get a chance to do that! Oh, it’s a story. When I was new in Zürich I was out on an adventure exploring the city on my bike and I came across this amazing place full of paper and materials and old presses. I met Christa and her Buchbekleidung and I was mesmerised. I promised her I’d be back one day to make something. Ha, so I did. It was a few years later, I came and I made an edition of 50 books. I felt like the bookbinder’s apprentice. I loved going in there each day gluing, pressing, cutting and smoothing my hands over the paper. You have to have the process all lined up perfectly and in order because once you get going you’re like a soft machine yourself. It took weeks. I had my own table at the back where I could also meet all the others coming in with their projects, designers, students, photographers and personal passions. My favourite was the most beautiful 80th birthday present to her Japanese friend from one young woman—80 four-leaf clovers collected and pressed and mounted, leporello on cream paper, bound with green linen, a treasure. So for me it was all about the atmosphere. I became a part of the family such that at the last minute I was sent off, when she couldn’t make it, with my book to represent her at the Art Book Fair in Frauenfeld. And, wow, another fascinating world was opened. You can see I could go on. I guess I love books, so getting behind the scenes and intimate, making them by hand was just, special. … my art seems to illustrate the story I’m in. You have an interesting professional history—having been a professional surfer, for example—but you’re also a certified coach, and are trained in the Feldenkrais First-Step physical therapy method for babies and young children. How does your painting and art intersect with all this? Good question and, like putting those pesky words in a good line, I’m not great at one track. But my art seems to illustrate the story I’m in. Like when I was studying and reading tarot I painted my way through the whole 78-card story. It became a ‘pathworking’, a way to sink into a direct knowing of the meanings within them. Pocket Money was really about moving countries and having to find out who I am now and what I want to do. Some wise person said about starting a blog, just keep doing it for six months and look back and see what you seem to write (or draw or paint) about. Pocket Money became the illustration of what I found. In the art classes I lead now, be they adults or children I set a space for them to explore where they are and see where the painting leads them. In my coaching I find it’s people having to make a transition that are my clients. It might seem a bit left field to have recently added ‘First Step Instructor’ to my tool kit, but I reckon becoming-a-parent and just-entering-the-world are two of the biggest transitions you can get. First Step is a hands-on help, and sometimes that’s what you really need. Its roots are in the Feldenkrais Method (and here’s where the surfing comes in). Back then, as a professional surfer, it was the Feldenkrais practice of awareness through movement and functional integration that had the most profound effect on my development. I believe it still does. As we bring ease into our movements and loosen up our ideas of who we are supposed to be the flow and the magic come in. You’ve just made Pocket Money available on other platforms like Amazon via Ingram Spark. How did you find the process of getting it from the hand-made edition to a more widely available publication? That was quite a different challenge. Now I’ve learned the computer programs and how to do it all myself … remind me next time to have someone else do it for me! It probably took as much time, but the digital mistakes aren’t nearly as fun. My first run of handmade-backwards books at least got their own nick-name and a laugh— ‘the Israeli Edition’ … All my computer glitches just ended up ‘Der’ and ‘Grrr’! Still, now I’m done I am so excited to think I can ship one off, a surprise present to anyone anywhere. That can only be cool. What’s the next art project for you? 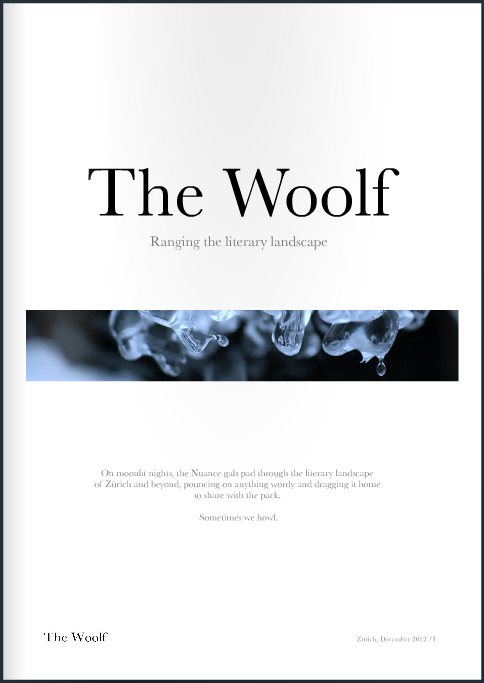 And The Woolf special question: What’s one of your favourite works of fiction, and why? Oh my, how many? Okay … The God of Small Things. Arundhati Roy transported me through all her knowing, deep, vivid and delicate descriptions. There is one image that still lives in my memory. Where Velutha makes the swim across the river naked and, “The moonlit river fell from his swimming arms like sleeves of silver.” I wish I could catch that in paint. Kaye Llewelyn is an artist, coach, emboldener … you can find her throwing paint, rolling with babies, or looking for adventures on her bike with the red spotted seat. See more images from Pocket Money in this issue’s Gallery. Pocket Money is available on Amazon or The Book Depository.